Normally a pretty packed and bustling go-to spot. On Saturday mornings around 10:30 you can have a great easy meal where you don’t have to rush. 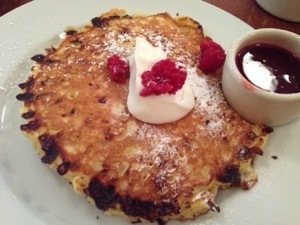 Since it had been a while since I had breakfast there- this visit I went with the Ricotta pancakes. They come with a tart-sweet fruit puree and an extra dollop of ricotta cheese. While not as brightly flavored as say the way Cafe Mystyque does with its addition of citrus peel. Chow does a good job with them.